Totally disappointed to see that Triathlete magazines' January 2014 issue is still carrying these pseudo editorials which are actually advertisements. You have to actually look really hard for the word ADVERTISEMENT. While I'm sure the product manufacturers will totally claim their products is safe, and I'm sure it is based on the claims they make in the advertisement, it is surely only a short swim, bike and run from legal EPO remedy to illegal ones? Given the focus on drugs in triathlon, with the recent debates at the Triathlon Business International conference, triathlon must not just talk a clean game, but actually be seen to be clean as well. Yes, this product may be legal, yes Triathlete, currently owned by Competitor group, is an independent, for profit business. But really, faux editorials, sold as advertisements, authored by Mark "The pressure to win is so enormous that many horsemen resort to whatever it takes to get a piece of the purse or a decent sale… even if it means putting their horses’ lives in mortal danger by doping them with illegal synthetic erythropoietin (EPO) drugs to boost endurance." Hanson, who seems to be just as much an expert on horse EPO as he is on triathlete performance. There is definitely a debate, and we started to have it at the TBI Conference, about a certification, endorsement, and list of ingredients per supplements, so athletes know precisely what they are putting in their bodies. Interestingly, EPO-BOOST says they've partnered with the Banned Substances Control Group, headed by Don Catlin, a key speaker, advocate and part of the TBI Panel. Don was one of the people that answered my question about making data from tests, both supplement and athlete publicly available for analysis, as problematical. 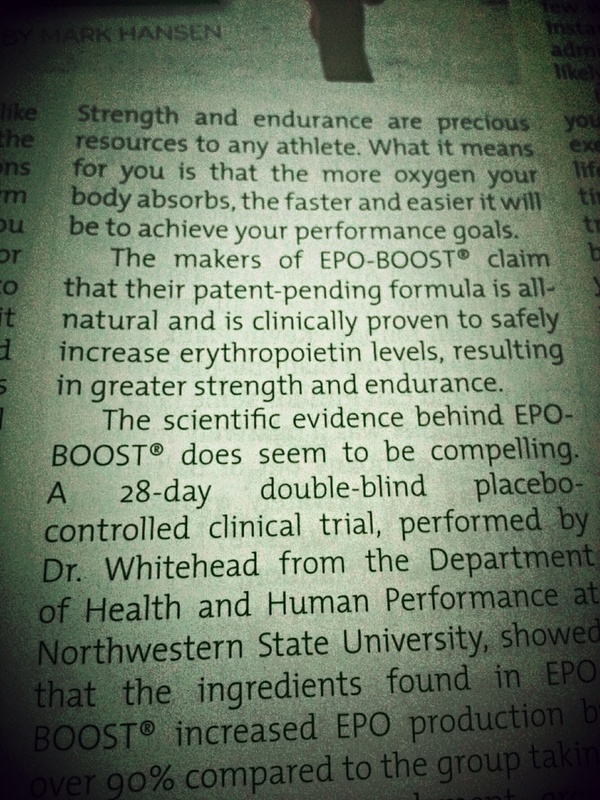 Given EPO-BOOST is totally legal, it's just another supplement. During the same panel WTC/Ironman CEO Andrew Messick said "supplements are bad news. You don't know what's in 'em, athletes don't know what's in 'em, you don't know how they are manufactured, and they are and have been within the performance world the source of an enormous amount of angst and grief for athletes". Messick later in the panel apologized for a sweeping generalization after being challenged by a representative from Herbalife, who are a race sponsor. So, while EPO-BOOST may be legal, isn't it about time magazines and organizations in triathlon stop skirting this legal/illegal boundary and take a principled stance. This would be a start to sending a clear, unambiguous message.